Perfect for indoor! 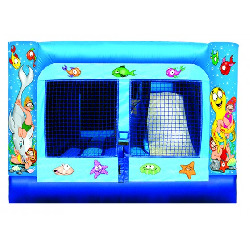 The mini combo bouncers keep the fun rolling along in the cold winter months. Designed to fit in any small space. It will fit inside homes, garages, basements, childcare centers, and any other confined area. Dimensions: 10'L x 13'W x 10'H. Please allow 14'L x 17'W space for adequate clearance.